Located right on a beach in Nusa Dua, Samabe Bali Suites & Villas is a high-end resort that is the very definition of VIP accommodation. If are looking to splurge on luxurious accommodation for your romantic Balinese holiday, then you won't find a place better than Samabe Bali. Surrounded by tropical rainforest with its own private, white sand beach, Samabe Bali is renowned for its tranquillity and privacy. It is an ideal choice for those who want a quiet and relaxing holiday where you can let the love blossom. Nothing induces romance more than ocean views and you will be glad to know that Samabe Bali offers stunning views of the Indian Ocean. All of the rooms and villas overlook the ocean, so you can enjoy the view wherever you are. The resort's restaurants also have ocean views, so you can enjoy the finest dining while looking out at sparkling blue. 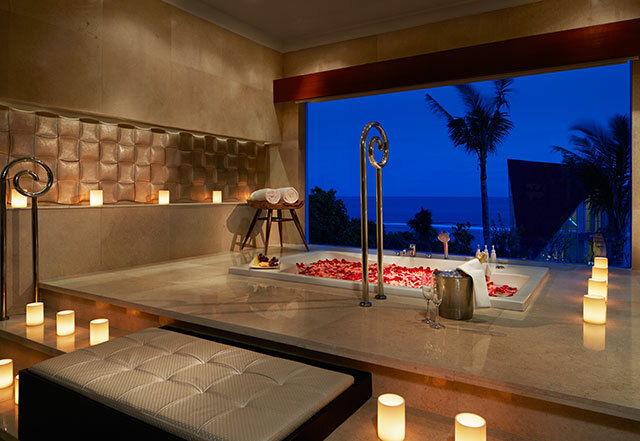 The hotel also offers extra luxuries that you won't find in many of the nearby resorts. For example, it offers a personalised butler service that will tend to any requests you may have. You can even request a private beach picnic on the whiter then white sands of our private beach, we'll set up the romantic pergola setting for you. If you're thinking of proposing on your holiday, it's hard to imagine a better place.